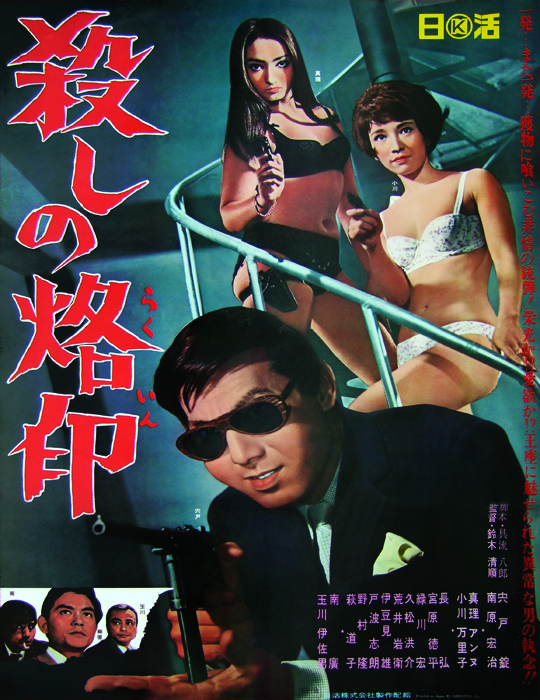 Branded to Kill was conceived by entertainment studio Nikkatsu as a low-budget hitman picture. Their standard B-movie shooting schedule allowed one week for pre-production, twenty-five days to shoot, and three days for post-production. With a budget of twenty-million yen, the project was ready to begin. However, the studio executives, unsatisfied with the film’s formulaic nature, found themselves unable to proceed. From here, they brought in the auteur director Seijun Suzuki to do a rewrite. By the mid-sixties, Nikkatsu had begun to lose their patience with Mr. Suzuki. His films boasted a strange visual style, irreverent humor, and plots that ran on a sense of “cool” rather than logic, which the studio executives felt “made no money and made no sense”. He would experiment with lighting, color, and editing while often trimming down the script to the absolute minimum to carry a story – sometimes not even that. 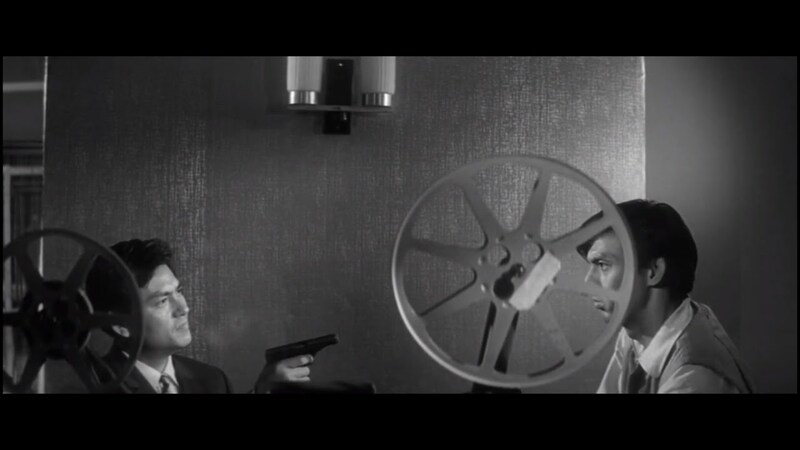 In an attempt to rein him in, Nikkatsu cut his budgets and forced him to film Branded to Kill in black and white. Unfortunately for the studio, this caused Suzuki to become even more creative, making the already indecipherable script even more nonsensical. When the executives saw the finished product, they felt it was too terrible to warrant a release, prompting them to shelve it. 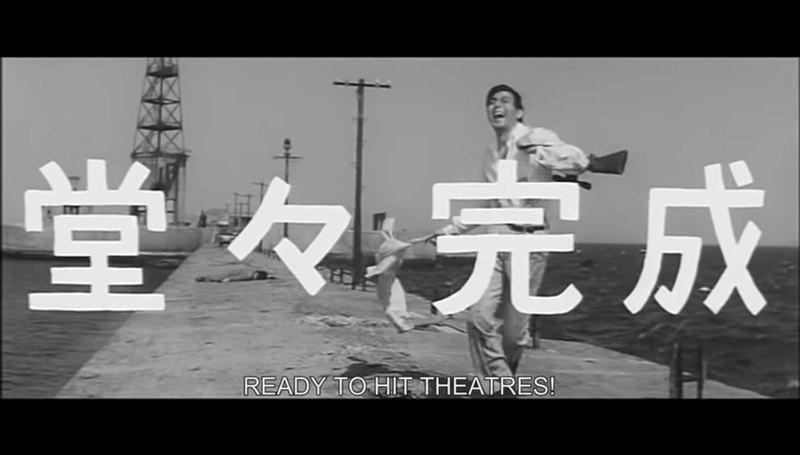 Mr. Suzuki, along with other people working in the industry, film critics, and students, staged a protest, believing that Nikkatsu was obligated to release Branded to Kill theatrically. In the ensuing court battle, the judge ruled in favor of Mr. Suzuki. As a result of the verdict, Nikkatsu had to pay for the damages and allow the film to debut in theaters in 1967. “Whether the studio executives like it or not!” was implied. Shortly thereafter, the director’s contract with Nikkatsu was terminated and he found himself unable to work on a feature film for the next ten years. Despite the turmoil surrounding its release, Branded to Kill would become a firm favorite with many future big-name directors such as Wong Kar-wai, Takeshi Kitano, and Quentin Tarantino. It is now a cult classic that is often considered an absurdist masterpiece by its ardent fans. With Tokyo Drifter, Mr. Suzuki firmly established unique, in-your-face style with a protagonist who often sang the film’s theme. The song was notably diegetic, for other characters openly commented on this bizarre habit of his. Mr. Suzuki continues this trend with Goro Hanada. Despite priding himself as a cold-blooded killer, Hanada has a peculiar fetish for sniffing boiled rice. The director reasoned that “If he were Italian, he’d get turned on by macaroni, right?” I see it as a roundabout way of humanizing somebody who would be a generic bad guy for the hero to gun down by the dozen in any contemporary film. There are quite a bit of satirical elements to be found in Branded to Kill, particularly of the James Bond and film noir works from which it takes inspiration. While in American film noirs, the protagonist strives to be the best in their field, Branded to Kill has a ranking system for its underground assassins. The obsession over this ranking system is demonstrated in an early scene when an inebriated Kasuga takes advantage of the ambush in an attempt to kill Kō, who is ranked fourth. Said attempt is decidedly foolhardy, as he screams at the hitman at the top of his lungs. Impressively, given his avant-garde tactics, he manages to fatally wound Kō, though not without perishing in the attempt himself. It turns out going into a gunfight sober and not alerting enemies to your presence or intent counts for a lot. I also see a lot of the same story beats as I did in Tokyo Drifter, which was released the previous year. The most notable one is how it deconstructs the yakuza sense of honor. Characters will often talk about how honorable they are, yet never miss an opportunity to be rude, petty, or underhanded. It’s especially noticeable after film’s major turning point. Hanada ends up killing the wrong person during a job and is subsequently targeted by his fellow hitmen. None of that supposed honor is present in these people, who regularly ambush him at a given notice. Though there is quite a lot to like about this film, it does have its share of flaws. After Hanada kills Sakura, the second-ranked hitman, the film seems to lose focus on the plot in favor of following around the protagonist and record him doing random things. While it’s obviously done for the audience to gain insight into the lead’s character, the surreal tone makes it difficult to comprehend what is going on for roughly twenty minutes. This would be defensible in a three-hour long epic, but Branded to Kill is only ninety-eight minutes long, thereby causing any filler to stick out like a sore thumb. At this point, Branded to Kill was reminding me a lot of Tokyo Drifter, which suffered from a similar problem. I think the Achilles’ heel of both films is that the style supersedes everything else – including the plot. As such, characters will often decide to do things and act the way they do for no clear reason. However, unlike Tokyo Drifter, and to this film’s credit, it does eventually get back on track around the third act. After killing his own wife in self-defense, Hanada decides to take out the mysterious first-ranked hitman simply known as Number One. It’s as good a plan as any, and the sequence of him storming the yakuza stronghold is very creative in its execution. Hanada uses his own car as an unconventional tank, pulling a rope to advance slowly towards the gunners as gunfire rains down upon him. In a film that previously saw Hanada shooting an optometrist through a pipe so the bullet came out through the sink and popping out of a cigarette lighter billboard to snipe a customs agent, this sequence still managed to stand out. Branded to Kill even manages to reference The Odd Couple at one point of all things. Number One is eventually revealed to be the client Hanada and Kasuga escorted at the beginning of the film, and he employs far different tactics than his inferiors. He stages an extended siege of the apartment in which Hanada has taken refuge in. Once Hanada is worn out to the point of exhaustion, Number One moves in and agrees to a temporary truce, linking arms wherever they go to ensure neither breaks it. I do have to admit that the film began losing me again with the ending. Number One disappears from the scene and tells Hanada that he will be waiting at a gymnasium with Misako, the resident femme fatale. Hanada waits, but Number One doesn’t show up. As he turns to leave, a tape recorder explains that “this is the way Number One works; he exhausts you and then kills you”. Despite being ambushed by Number One, Hanada is inexplicably saved by a headband he dons, and manages to kill his assailant. An exalted Hanada declares himself the new Number One. Misako to enters the arena seconds later, and in his crazed state, he instinctively guns her down. After that he falls from the ring, disappearing from existence. The problem is that Branded to Kill doesn’t so much end as it does stop abruptly. It was building up an epic showdown between Hanada and Number One only for the shootout to be over within a few minutes. The competent hitman shows none of the talent he spoke highly of earlier; he had the upper hand, yet went down with barely a fight. Though this could have been a commentary on Number One thinking highly of himself to the extent that he doesn’t have a firm grasp of his actual competence, the narrative doesn’t successfully hammer the point home. As with everything else, it happens because the director said so. Branded to Kill is, in a lot of ways, an extreme version of the French New Wave film Breathless. While Jean-Luc Godard did have a script when he began shooting, it wasn’t finished; he often wrote scenes in the morning and filmed them later that day. Mr. Suzuki went a step further in that he wrote the script as he filmed. On top of that, he forewent any notions of storyboards or pre-planning and the final cut was notably edited in only a day. In both cases, it’s remarkable that the end products are as comprehensible as they were, let alone able to amass the level of critical acclaim they enjoy today. Despite the positive impact it had on the medium, I do find recommending Branded to Kill a little tricky. I do think it comes out ahead of both Breathless and Mr. Suzuki’s earlier effort, Tokyo Drifter. All three films ultimately promote a style-over-substance ethos, yet Branded to Kill, with its campy B-movie qualities is a lot more of a fun watch than the other two. As such, I could easily envision fans of such films screening Branded to Kill at a get-together and having a blast with it. If somebody wanted to get into the yakuza genre, there are certainly worse choices to use as a gateway film. That being said, it’s not a film I would use if I were introducing somebody to Japanese cinema. The elements for a genre-defying masterpiece are there; this is a film that blends together James Bond, noir, gangster, and The Odd Couple elements. While it sounds incredible on paper, the problem is that there is little cohesion between them, and the short running time ensures barely any of these facets get a chance to meld or build off of each other. It’s appropriate that this film was admired by Quentin Tarantino because I do see a lot of that strange mixture of tones in Branded to Kill as I do in Reservoir Dogs or Pulp Fiction. Speaking retrospectively, I feel that those two films managed to execute what Mr. Suzuki was going for to a much greater effect. In the end, I feel Branded to Kill gets wrapped up in its style, yet it manages to be a mostly enjoyable watch despite itself. I was disappointed by this one as well despite it’s “classic” status. Way too wacky, even for me. However, I did prefer an earlier effort from Suzuki, also starring Squirrel Cheeks Shishido, “Detective Bureau 2-3: Go to Hell B*st*rds!” (reviewed on my site.. 😉 ). Still offbeat but far more palatable and less indulgent. I think that like Tokyo Drifter, Branded to Kill chose to place style before substance, and it’s a weaker effort for it. I do, however, think it has more fun with its style, which is why I feel it’s the superior effort to Tokyo Drifter, but I still find it a tough sell. I may have to check out the one you mentioned. It certainly has a distinctive title! I guess studios feuding with their directors isn’t a recent thing. At least a B-Movie is less of a risk than when things go sour with a Blockbuster title. Surprised that courts can force studios to release a film. That would be a resounding no. For that matter, if Tokyo Story is any indication, distributors dropping the ball isn’t a new phenomenon either. On some level, I can sort of see where the executives come from because, in all honesty, it’s really only in hindsight that they look foolish. On the other hand, their risk-adverse nature is quite frustrating for directors and viewers alike. Either way, I’m surprised the courts mandated the release of this film myself.